[182 Pages Report] The Wi-Fi chipset market is expected to be worth USD 19.72 Billion by 2022, at a CAGR of 3.5% between 2017 and 2022. The base year considered for the market estimation of the study is 2016 and the forecast period is between 2017 and 2022. This report provides valuable insights into the ecosystem of the Wi-Fi chipset market. The major players in the market include Qualcomm Technologies, Inc. (U.S.), MediaTek Inc. (Taiwan), Intel Corporation (U.S.), Texas Instruments Incorporated. (U.S.), STMicroelectronics N.V. (Switzerland), Cypress Semiconductor Corporation (U.S.), Marvell Technology Group Ltd. (Bermuda), Samsung Electronics Co., Ltd. (South Korea), Quantenna Communications Inc. (U.S.), and Peraso Technologies, Inc. (Canada). Wi-Fi-Bluetooth combo chipset market from 2014 to 2022. 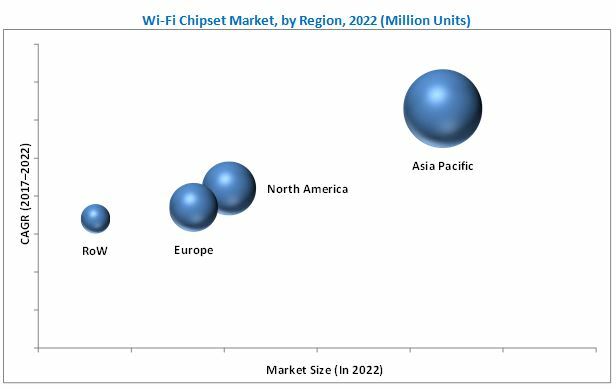 The Wi-Fi chipset market was valued at USD 15.89 Billion in 2016 and is expected to reach USD 19.72 Billion by 2022, at a CAGR of 3.5% between 2017 and 2022. 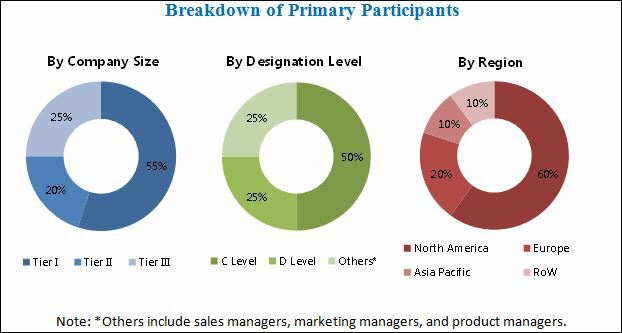 The growing number of public Wi-Fi hotspots, growth in connected devices ownership, rising demand for WiGig technology, and growth of Wi-Fi technology in enterprise and business are the major drivers for the market. The scope of this report covers the Wi-Fi chipset market on the basis of product category, MIMO configuration, band, IEEE standards, and geography. Among the IEEE standards segment, the IEEE 802.11n led the market in 2016. However, IEEE 802.11n is expected to lose a significant market share to IEEE 802.11ac Wave 1 standard and 802.11ac Wave 2 standard in the overall Wi-Fi chipset market during the forecast period. The IEEE 802.11ac standard allows for theoretical speeds up to 6.9 Gbps in the 5 GHz band.